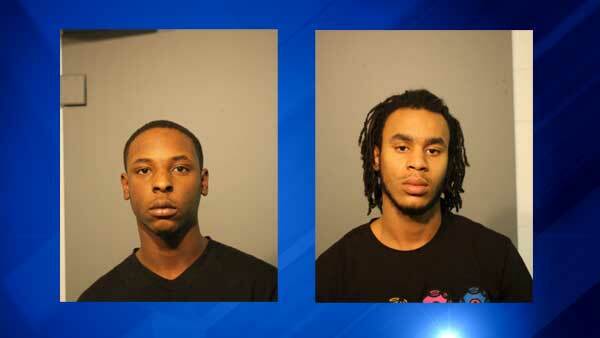 CHICAGO (WLS) -- Joshua Almore and Anthony Harris, both 22, face charges in a drive-by shooting that injured a 23-year-old man in Chicago's Lawndale neighborhood. Officer on patrol saw shots being fired from a Jeep Grand Cherokee in the 3100-block of West Polk Street around 8:15 p.m. Sunday. They pursued the vehicle and arrested the two suspects after it crashed into an iron fence. The 23-year-old victim was taken to the hospital with a gunshot wound to his right foot. Almore, of the 9300-block of South Ada Street, was charged with aggravated battery with a firearm, armed robbery, unlawful transport of a stolen vehicle, driving without a license and a traffic signal violation. Harris, of the 1600-block of South Komensky Avenue, was charged with aggravated battery with a firearm, armed robbery and criminal trespass to a vehicle. Both suspects are due in bond court on Tuesday.